So it happened again, I found myself sewing a bunch of new swimwear just before we set off on holiday. We're back home now, and back to school and work, so it's time to relive the awesomeness of summer holidays and share the awkwardness of photographing swimsuits. When in doubt, look away and pretend you're somewhere, or someone, else. So this Tarzan-esque number is Vogue 9192, which has an impressive number of different garments in the one pattern. I've made View C, one of two one-piece costume options included in the pattern. I had some khaki green lycra but thought that might be taking my Tarzan fantasy a bit far , so settled instead on this nice wine-y purple-y red. - appropriately called Merlot on the Aussie version of the Carvico VITA swatch book. Back to the pattern.... I cut a straight size 14 as per my measurements, and for this first go at the pattern, I made no changes. I think I might be a bit stuck in the eighties when it comes to swimsuit styles as I'm finding these leg holes too low for my liking. Now I'm not suggesting going the full 80's Brian Rochford, but when I searched for images to try and explain what that might mean to an international audience I found this reference for early-mid nineties Brian Rochford and there's my leg hole height right there, please. Those few wrinkles in the mid back section are all that results of the gathering for the right side seam. It seems like quite a bit of gathering as you sew it, but once on, the side seam doesn't look gathered, just a bit puckered. I'd be tempted to either shorten that side and straighten the seam out altogether, or lengthen it at least half as much again so that the little wrinkles turn into some proper ruching. The swimsuit is fully lined, front and back and then there's a shelf bra which is finished with elastic under the bust. I had very little left of that nice, cotton touch, self striped lining fabric (like this), so mostly lined with a mesh knit as I knew that self lining with the VITA would make it way too thick. The mesh knit is a bit synthetic feeling and quite a bit more stretchy, but has so far stayed on the inside and not wandered out under the elastic and into view. I did have enough of the nice lining for the shelf bra, and a little gusset bit - that open ended crotch pocket that always just filled with sand when you were a kid at the beach! Can't believe I elected to add that to my swimsuit after all those years of wondering why swimmers always came with a sand pocket just where you didn't want one! No fear about the one shoulder leading to wardrobe malfunctions, it stayed put nicely even when I was being silly. Love this! Actually, I loved it so much that I clicked right over to Vogue and bought the pattern (you get commission, right? :)). Oh wow, that's the ultimate compliment! i look forward to seeing your version one day - you'll rock this! Thanks Marisa, you know which kid loved it right? The one who has been wanting a one sleeved off the shoulder skin tight top for ages. The minute he saw this he complimented me on it, then said he'd quite like one just like it, if only he hadn't let his sister have that cheetah fabric. oh lord! Love the suit and it looks great on you! I just bought a suit (not having the sewing chops to make one....yet!) and I noticed that the straighter/lower leg opening seems to be the thing now. I was looking at the suit like....um....is this right? Is this left over from olden days or something? I was assured by the salesperson that this is indeed the current look. Thank you! The leg shape does seem to be a trend, but like those super low waisted jeans that I avoided for a decade, I'm thinking I'll give the 50's leg cut a wide berth. Omg, the "sand pocket." I'm DYING. Lady, you crack me up! The swimsuit is really nice, by the way! This swimsuit is perfect! There seems to be more gathering on the cover. The colour, the ring, the model - perfect combination ;) I like this leg opening personally. 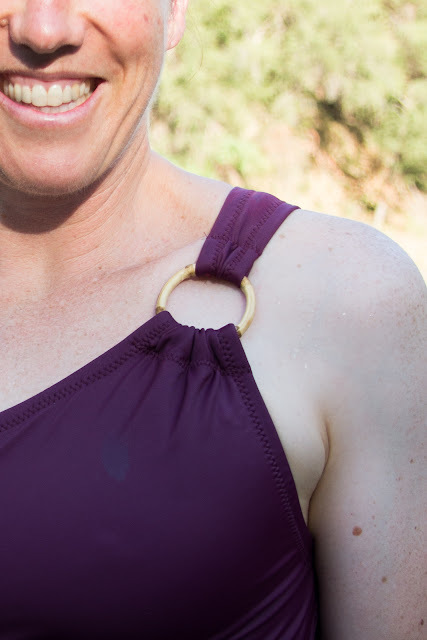 You look amazing in this swimsuit and Jimmy is a gem to find the bamboo O ring for you. Oh the sand in the swimmers, not so good memories. THanks Sharon. Jimmy is great. Maybe I talk too much but he always seems to be keen to get involved in my little projects and find me just what I need.